While many stereotypes about Gen Y are true – we like to ask ‘why’ and our mobiles are never far away – there are a few that I’m trying to breakdown in my workplace. As a young woman finishing my university degree, I wondered what my first job would be like and whether I would have the opportunity to apply the knowledge and skills acquired from my three years of tertiary education. I’m currently in the process of completing an internship at a marketing agency, and it was through this that I secured my first part time job. I’m currently at my desk in an office, with my new job description of ‘marketing communications coordinator’. I’m in charge of social media and administration tasks. For me this is true responsibility – I understand the importance of social media in today’s world. In my short (three week) professional life, I have learnt many things. I’d like to share some of these learnings with you, especially how the workplace and Gen Y can achieve great mutual benefit. It can be easy to assume that your new employee will be able to fix up the technological problems in the office. However it’s important to understand that it may take time for them to understand your network or your procedures. Teach them the phrase ‘I know it’s possible, it will just take time for you to learn’. This is useful when trying to explain that with trial and error, a solution can be found. If you’re hiring and want someone to do exactly what has always been done, in the exact same way, make sure you’re clear. However, if you encourage discussion and are open to the idea of trialling a new program or approach to a task, then tell your younger employee that you’ll give full encouragement and support. This tactic will motivate Gen Y to explore and justify their thoughts. It might be beneficial to sit down with Gen Y employees to go through a list of priorities for them to focus on and outline your expectations. It may be a struggle to connect in new social situations, especially in a professional environment. 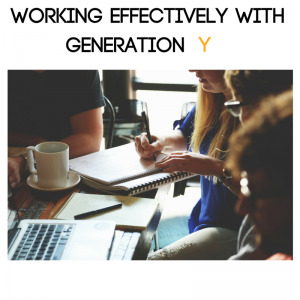 Encourage Gen Y to join in office discussions or activities. They might not follow the discussion entirely but it’s almost guaranteed that the offer to be included is appreciated. They’ll quickly learn what is and isn’t appropriate in the office, and they may provide a fresh perspective on the discussion. Just because they may not have a mortgage to take care of or 40 employees to manage, it doesn’t mean they don’t have their own issues cropping up. They’re learning how to manage their time, priorities and relationships just like everyone else – they’re just new at it. If they don’t quite make their deadline or complete a task to standard, help them work out why. It might be a matter of limited knowledge or mismanaging their time unintentionally. Once you help them learn from their mistakes, they’ll be less likely to make the same ones again. Gen Y, like the rest of the population, is made up of individuals. As with everyone else in your workplace, as a manager or boss, you’ll need to invest time in observing, guiding and establishing what works and what doesn’t. We’re more than our age –we are enthusiastic, hardworking and understand we have a lot to learn before we can even begin to think about filling your shoes. The more time and effort you invest in us, the more benefit you’ll receive. Let us know how we can help you and maybe mentor and coach us, then you’ll be well on the road to a professional and beneficial workplace relationship. This article was written by Rhiannon Rak, OCG’s Marketing Communications Coordinator. To discuss how Options Consulting Group can help you during your recruitment journey, contact James McVey, Kate Lacey, John Gilbert or Chris Wood on (03) 9693 9300. Stay up to date with OCG on social media.